Almost everyone loves either taking photos or having their photo being taken. I went through a 'stage' where I was joining openshoots which is an event where a photographer would create a photoshoot theme and offer their services ranging from Php500 to Php1,000 and you can get styled with make-up and enjoy the expertise of a great photographer you then receive a copy of high resolution photos. It was a great way to start your portfolio as well as practice in front of the camera. I love photoshoots, I don't have perfect angles, cheekbones or a great jawline but seeing my photos professionally done is just something I admire. I have had the opportunity to work with a lot of photographers both local and foreign (if I have the guts, I'll post some of those photos here). Logo from Mrs. Philippines-Globe official Facebook page. But I don't think I was prepared enough for this particular pictorial. It is definitely different from all the photoshoots that I have engaged in before. 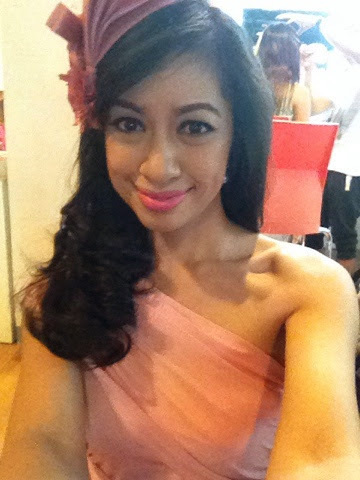 I was so nervous because I knew that this was for our first official shoot as a candidate for the Mrs. Philippines-Globe 2014 pageant. You have to be nervous when you are surrounded by other 22 beautiful women a very large production team and a former beauty queen in Ms. Morena Carla Cabrera-Quimp who is over-looking everything. Pressure bring it on! I was so happy that we were in good hands though, the make-up team was awesome and I really saw my face transform from a commuter to a glamorous royal Mommy, I wish I had a before and after photo. Sorry for the blurry photo, isn't the make-up awesome? The dresses were superb, and Karimadon provided the perfect look, I was totally giddy that I got my favorite color to wear! 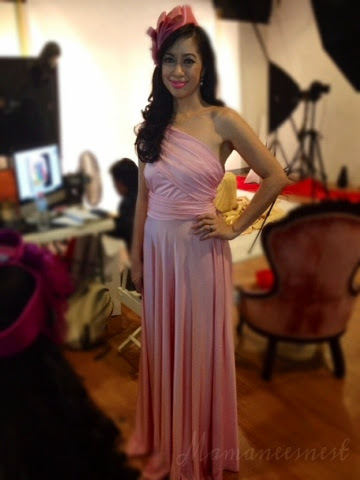 V, who was our stylist and a former office mate, chose a pastel pink jersey gown for me and a pink fascinator with dainty dangling earrings. Super loved this gown from Karimadon. Although, we weren't allowed to upload photos before the official release, we all took our selfies and my co-candidates even took group photos since we just couldn't get over how royal we looked. When I was called for my turn, I gulped and prayed that I could pull it off. I studied the pegs posted on the wall to learn what look they were going for, so as soon as I sat down on the regal chair I said to myself that I am a royal Mommy, hahaha. Trying to psych myself! Gladly there was a full length mirror in front of us to check how we look and mind you that is Paris Hilton's secret to a great pose. Ms. Carla was right there watching and I said to myself "Be yourself and project!" Gladly, I finished in one go! When the photos were checked by Ms. Carla, she said "We're good." Yehey! Triumphantly, I stood up with knobbling knees and thanked the photographer for the awesome collaboration. 1. Relax, when you are being tense it can been seen in a photo. 2. Work with your photographer, the outcome of a great photographer shows when you have a good relationship with your photographer. 3. Know your angle, mine has always been my left. You can discover your angle by looking in a mirror and seeing what is your best side. 4. Smize, practice in front of a mirror where your eyes are like smiling. A smize reaches out to the person looking at your photo. 5. Body Angles, it is important that you know how to make your waistline show by bending the right way, pull your shoulders back and always show your neck (just as Direk Raymond would always say), it makes you look taller. After a group photo, we had a little lunch then gladly went home. Thank you to Randy for the wonderful job on my hair and make-up, to V for remembering me because of my 'stockings' at work, to Grenjen for the drop off and laughs, to Jem my travelling buddy, to Ysa the dedicated photographer and hunger-pang buddy, to Mae for patiently reminding us of our schedules and answering my questions and to Ms. Carla to always making sure we are taken care of. Now that the official candidate photos have been released, you may view all the photos on Mrs. Philippines-Globe 2014 Facebook page. Official Candidate photo for Mrs. Philippines-Globe 2014 Facebook page. And if you you can also like my photo then that will be totally grand! Please?? Hehe. Please click on this link and click on like! Thank you dear lasses! Please join me on my Mrs. Philippines-Globe 2014 journey by following my Pageant Diaries posts. Proud representative of Mommy Bloggers Philippines! Disclaimer: Mamanees Nest does not own these photos unless otherwise stated. Photo credits are noted to the rightful to avoid copyright infringement. Lovely photos! I don't think I know how to smize LOL. I wish you the best of luck! Thanks Jhanis! :) Don't worry if We ever get to meet up, I will teach you hehe. There's a celebrity you look like and I can't say who that is, I'll research for that one. Like Jhanis, I wish you the best of luck! Well I have been told that I look like, Erica Fife, Sharmaine Arnaiz and Anne Hatheway. Hahaha. Maybe, one of them? Thank you! You really look good. Good luck! Thats a lovely fascinator you are wearing! I came across a beautiful range of fascinators & hair accessories at an online store. Hope that it will help Janice. :) The gown was also divine to wear! Grabe you are so pretty. I saw you in the 3M event eh, you were in the row in frot of me. Sana naghi ako hehe nahiya kasi ako. Anyway, I votednfornyou! I hope you win. Awww, really hoped you would have said Hi, it would have been nice to meet you. Next time please! hehe. Thank you sa compliment Jho! You look really great. Thanks for the tips. 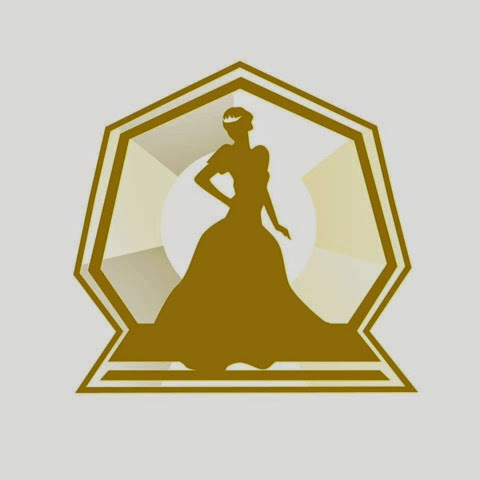 It must really take a whole lot of courage to join a pageant like this. So much courage Ditas. :) You are welcome and Thank you too! You are so pretty! Good Luck with the pageant! Lots of luck for the pageant! You look lovely! All you women should stand proud being chosen to compete for the title. You are all winners!